Gwleidyddiaeth, llyfrau, bywyd, iaith a'r hyn a'r llall. Dim ond ishe gwneud sens o bethe dw i. Politics, books, life, language and this and that. Just trying to make sense of it all. Confronted with what is rapidly turning out to be the nastiest, most extreme government in living memory, we have the weakest, most ineffective official opposition since the Ramsay Macdonald era, with the SNP and Plaid's three MPs doing the job which Labour was elected to do. Labour's latest leadership election may be over, but the civil war continues, with many of the red princes and princesses happily working with the Tories to undermine their own leader. Read Professor Richard Wyn Jones's account of the Wales Bill, currently working its way through Westminster. Only a very limited amount of parliamentary time has been set aside for debate, he writes, "which would be a pretty outrageous way of proceeding were it not for the fact that the official opposition has made such ineffectual use of the time that has been allotted." The Conservatives and Labour’s Owen Smith combined to veto every single substantive recommendation made by Silk for further devolution in the field of justice, this apparently in order to protect the integrity of the unitary England and Wales legal system. There are Smith and other Labour colleagues representing Welsh constituencies working their expensive socks off to frustrate the lack lustre Labour administration in Cardiff to ensure that all real power and control over Wales stays in London. George Thomas must be smiling in his pit in hell. A couple of weeks ago, Labour tabled a motion in the House of Commons calling on the UK Government to withdraw support for Saudi Arabia's lethal campaign in Yemen where good old British bombs are being used to terrorise the civilian population. Children there are starving to death. Around 100 Labour MPs absented themselves from the vote, some with legitimate excuses, but most with nothing more than a desire to humiliate Corbyn. Again it seems that some Labour MPs actively worked with the Tories to defeat their own party's motion. Among those absent from the vote was Nia Griffith, MP for Llanelli. Nia Griffith who joined Corbyn's shadow cabinet, then resigned from it in Owen Smith's botched coup, then re-joined it and now seems to be running with the hare and hunting with the hounds. The narrative being put about by Labour's red aristocracy is that Trotskyists and other extreme elements are taking control of the party's machinery, and that across the length and breadth of Britain constituency parties are dusting off the guillotines for a wave of brutal de-selections. Obviously, the Tory press has been only too pleased to trumpet that message for them. How true any of that is remains to be seen. Meanwhile in Llanelli a real purge is underway, but here the party is lurching to the right, parachuting in red Tory reinforcements and morphing into a kind of pink UKIP-lite with a side-helping of Trump, amid accusations of bullying and character assassination. If you listened carefully while outside County Hall the other week you would have heard the sound of champagne corks popping in the Executive Suite at the news that Cllr Bill Thomas (Lab), one of the chief executive's bêtes noires, had been de-selected from his ward in Lliedi. Bill Thomas has ploughed his lonely furrow for 17 years, doing the sort of things which most people would like to imagine that all councillors do. For starters, he has a mind of his own, which marks him out from a good many of his colleagues. He has stood up for his ward through thick and thin, fought a long campaign to try to get justice for the cocklers whose livelihoods have been wrecked by releases of raw sewage into the Burry Inlet. He has fought an even longer and equally fruitless campaign to get justice for Mr and Mrs Clive and Pam Edwards, victims of incredible incompetence and an even more incredible refusal to put matters right by the council. He has banged on for years about the madness of building new homes on flood plains, and he played a key role in uncovering Mark and Meryl's plans to flog off Parc Howard in Llanelli - while Labour was running the council. Needless to say, none of this has endeared him to Mr James, and he has been ordered to sit down and shut up at more council meetings than most of us have had hot dinners. A few years back he stood up in a meeting of full council to allege, clearly very upset, that he had been put under covert surveillance by the council. The chair stepped in quickly to ask him for a quiet chat off camera. Last year, it emerged that Bill had received an e-mail from Mr James warning the councillor that the council had a file of documents which could land him in the High Court on unspecified criminal charges. As thanks for all those years of service and Bill's courage in fighting for his ward, Labour has now unceremoniously dropped him. Bill is said to be considering standing as an independent. Lliedi is a two-member ward, the other incumbent being Cllr Jan Williams. It is safe to say that Cllr Williams has been less turbulent than Bill Thomas, but quietly and efficiently she too played an important role in exposing the seedy deal which was being cooked up for Parc Howard. Both of these councillors are the sort of people anyone, no matter what their party politics, would feel comfortable discussing their problems with, but it seems her face no longer fits Labour in Llanelli, and it is claimed that she was bullied into standing down at the next election in May 2017. One of the prospective replacements for Bill and Jan is a young Labour councillor from Neath Port Talbot called Rob James. James is one of those young careerists Labour and the Tories specialise in nurturing. A degree in politics, followed by a job working as research and press officer for Glenda Thomas in Cardiff, and now constituency manager for Geraint Davies MP. In 2015 he tried and failed to become Labour's candidate for Cynon Valley for the 2016 Assembly elections. Out of a total of 17 meetings, Cllr James made it to just two. Perhaps old Cneifiwr is being selective, and choosing just a particularly bad patch when young Rob was indisposed, you may think. You would think wrong. His attendance figures for the various committees he is a member of are, if anything even worse. In 2014/15 he failed to attend a single one. If the good people of Lliedi opt for Rob James next year, his track record in Neath Port Talbot suggests they won't see much of him, and that he'll be waving them goodbye just as soon as he finds a constituency willing to adopt him. Anyone in Lliedi expecting a young radical determined to break with Labour's deeply entrenched, privileged elite will be deeply disappointed. Rob James' ambition is to board the first class gravy train and take his rightful place alongside Stephen Kinnock, Owen Smith, Chris Bryant, and the rest. A big clue about his politics is contained in the name of his blog, Centristvision, which rather like his activity as a county councillor, has not seen much action since 2012. Announcing his decision to move west, Cllr James told his followers on Facebook that he looked forward to campaigning on the future of Parc Howard. Despite the hard work put in by Bill Thomas and Jan Williams to halt the "exciting" plans which Meryl Gravell cooked up under the previous Labour-led administration, and despite Plaid's prompt removal of Parc Howard from the "asset transfer" list when it took over, Labour in Llanelli is now less interested in the boring process of obtaining grant funding for the house and park than it is in creating the impression that, under Plaid, the future of the place somehow hangs in the balance. A good example of the post-factual politics which are now all the rage. Why bother with the facts when you can just make up a story? Appalling though Rob James's attendance figures are, they look positively exemplary when compared with Labour stalwart Keri Thomas who has surely notched up what must be the worst attendance record of any councillor in Wales over the last 10 years. Prior to the 2012 council elections, Keri Thomas was absent for the best part of a year while undergoing treatment for a condition which, to put it delicately, was ironic for someone who hit the headlines in 2012 with an attack on Llanelli's Polish community and what he claimed were their drinking habits. Incredibly, he was nevertheless nominated by Labour to stand again, and was duly elected despite being unable to campaign. Even more remarkably, upon his return he was put on several important committees, including the Planning Committee. After a year or two of showing up to some meetings, his attendance fell off again to the point where recently he actually faced disqualification for not meeting the minimum of one attendance every six months - something which even Rob James managed in Neath Port Talbot. Rather than waving goodbye to someone who was clearly unable to perform his duties and serve the people who elected him, Llanelli Labour's finest decided to persuade their man to discharge himself from hospital so that they could wheel him into County Hall just in time to make sure that Cllr Thomas kept his £13,000 a year allowance for doing nothing, while avoiding a by-election. But all good things must come to an end, and Labour has now finally decided to wave goodbye to Keri Thomas at the next election, about ten years too late for the people of Tyisha ward. 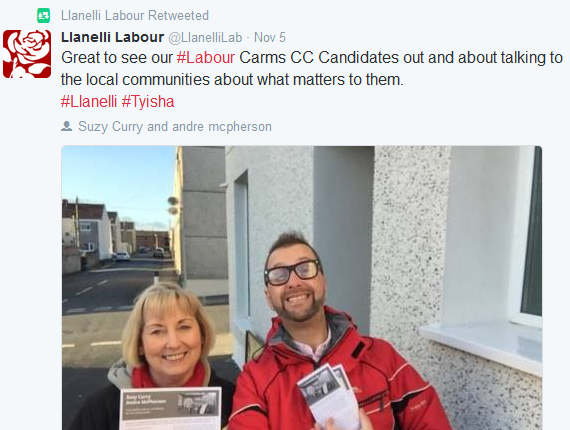 Like Lliedi, Tyisha is a two-member ward, the other incumbent being Cllr Jeff Owen, now an unaffiliated independent. 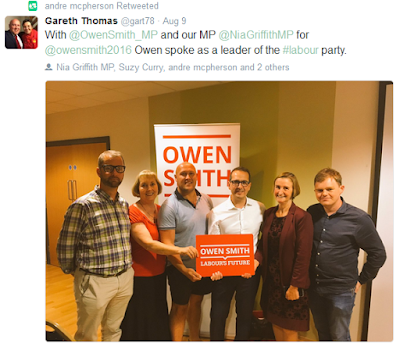 Mcpherson is yet another of those third sector/charity bosses who thrive under the network of patronage and nepotism cultivated by 'Welsh' Labour, and it should come as no surprise to learn that both he and Suzy Curry were fervent supporters of Owen Smith in his doomed leadership bid. Pictured alongside Oily and Nia Griffith are Mcpherson, Suzy Curry and Ryan Thomas, who was rehabilitated by Labour in Kidwelly after he narrowly avoided trial for sexual assault after waiting almost a year before apologising to his victim at the last minute. That's red Tory Owen Smith with his laddish misogynism and dogwhistle comments about immigrants who consistently blocks every attempt to devolve power to Wales and who bears more responsibility than anyone for the fact that Theresa May, Boris Johnson and the rest are facing an open goal where there should be an official opposition. Ryan Thomas is not the only Labour lost sheep to be rehabilitated. Over in Llwynhendy and Pemberton, business woman Fozia Akhtar stormed out of Labour after the last council elections with her former friend Theressa Bowen in a vicious spat with the grande dame of Llanelli Labour, Tegwen Devichand. Somehow, a reconciliation was effected in the case of Fozia Akhtar, and she returned to Labour in time to see her sister made Mayor of Llanelli and become embroiled in a row about a large Labour delegation nipping over to France to enjoy the delights of the Festival of Prunes in Agen. Akhtar's inexplicable return to the party certainly had nothing to do with left-wing entryism to boost Jeremy Corbyn's prospects because her Facebook page proudly displays pictures of a beaming Fozia hobnobbing with that rarest of visitors to Wales, the noble Baron Kinnock of Bedwellty. Fozia is also hoping to become a county councillor next year now that she and Tegwen have become friends again. A few weeks ago, viewers of the BBC's Question Time, or "Bigotry before Bedtime" as it is known in Cneifiwr's household, were treated to the sight of Labour activist Michaela Beddows hijacking a question about UKIP's latest punch-up to attack her own party's education policy and declare that she has "never had a problem with UKIP". So alarmed is Ms Beddows by plans to phase out dual stream education in Llangennech that she has vowed to put her six bedroom house up for rent and move out of the village if she does not get her way. Lee Waters, a red prince if ever there was, has bravely decided that the best way of dealing with the vicious campaign being waged by Beddows and others is to side with the red Ukippers. 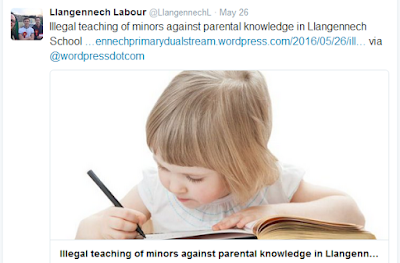 The result has been verbal attacks on school staff and governors and a hate-filled campaign of lies and vilification on a website which has drawn heavily on the "expertise" of Jacques Protic, author of the virulently anti-Welsh website, Glasnost. All of this and the leader of the Labour group on Carmarthenshire County Council, spiritualist Cllr Jeff Edmunds, about whom the Carmarthenshire Herald memorably said that if you looked up the definition of "lugubrious" in an illustrated dictionary, you would find a picture of Jeff. As if Llanelli did not have enough problems to deal with. A really entertaining and unsettling tale of how the civil war within Labour reaches in to the local sphere. I thought our local politics in Neath Port Talbot left a lot to be desired but ours seems kids' stuff in comparison. I don't think Councillor Rob James of Bryncoch South in Neath quite knows what he's letting himself into, but as you've said, the Lliedi seat is only another step on a journey to try and join the ranks of people like Boyo Kinnock and Oily Smith. It's already clear Rob James can talk the talk but isn't prepared to walk the walk. Contrast his laissez-faire attitude to being a councillor with that of the sterling work and commitment to such a job shown by someone like Bill Thomas, only to be cruelly shafted after all those years of service. How interesting to see that despite having all the commitments that being a Mayor entails, Bill Thomas has an attendance of 60% in meetings since May 2016 in comparison with the less than 12% of his wannabe replacement, "the Invisible Man" Rob James, in NPT. Quite frankly, the people of Lliedi are welcome to Mr James. Most of his present constituents will not notice he's gone because as the old saying goes, "you cannot lose what you've never had". I hope Y Cyneifiwr will keep us all up to date with how the civil war progresses, particularly with regard to the inevitable casualties. Great article. This is the best line of your blog. 'Why bother with the facts when you can just make up a story?' - This is exactly what you have done here. Rhetoric, smears and second hand tittle tattle via chinese whispers is what it amounts to. One fact you have correct is that both Bill and Jan have been great councillors and if you read what Bill actually said in the papers he put his non-selection for this vacancy down to £3 Corbynistas which doesn't exactly match your assumption that Llanelli Labour has lurched to the right. He is still at libery to apply for other vacancies. Indeed the chosen candidates so far come from all colours of the Labour spectrum with one thing in common they have been actively helping their community to date and wish to continue doing this as their representatives on the County Council. I await your glowing references for the Plaid Cymru Candidates over the coming months. Your welcome to Rob James, what I can't understand is his legal position. As a member of Neath Port Talbot he gives his address as Westernmoor in Neath, where he must be registered as a elector, he works in Swansea, and is seeking election in Llanelli, how on earth was he selected? Perhaps someone could explain the legal position. The de-selection of Councillor Bill Thomas by the Labour group only serves to show how committed and hard-working members are feared if they are also unafraid to challenge.It is an own goal by Labour and I sincerely hope Councillor Thomas will continue to hold the party to account.There must be something seriously wrong with the individuals who believe the record held by Rob James for attendance is worthy of selection for next years election.It is a disgrace. Anon@14.11 I have not had such a good laugh in days. The thought of those £3 Corbynistas voting for a besuited New Labour carpetbagger to replace a good local man. The same Corbynistas who presumably selected that left-wing firebrand Lee Waters. By the way, it was Labour that was running the council when Bill Thomas said that he had been put under covert surveillance. To suggest that someone who has served the community where he lives should make way for a near invisible councillor from Neath and apply for a vacancy elsewhere is pretty insulting, and I'm sure many of Bill's constituents will feel the same way. Gary, that is a very disingenuous reply, and you know it. Again, who was running the county council when the scandal about the secret talks on Parc Howards' future leaked out? Answer: Labour. Who removed it from the asset transfer list? Answer: Plaid. It is quite obvious that Labour is trying to spin a story which is the opposite of the truth. And the same goes for attempts to portray Michaela as a victim. With supporters like that and Jacques Protic you must feel very proud. 1.Bill was not deselected by the Labour group(CLP). Selections are down to the ward i.e. Lliedi Ward. Only the members of that ward can vote. I am hoping, personally, that he gets another seat to fight. These jobs are not for life though and for whatever reason they decided to select Rob James. 2. The Llanelli CLP is definitely not a 'red tory' domain. It has almost 600 members which range from hard left to moderates. They selected Lee because he was an exceptional candidate who is not in the Senedd just to make up the numbers but to fiercely fight for Llanelli. He has made an excellent start and we bucked the trend and achieved a 5% swing from Plaid which was pretty damn good considering we lost ground almost everywhere else. 3.Obviously someone is supplying you with this information but it would be good if occasionally you asked for comments on it before it goes to print to get a more even handed account of events. Nobody is expecting you to 'change your colours' just to be a bit more objective. Thanks Anon@20.53. I know that in theory councillors are selected at branch level, but the process is clearly open to abuse. 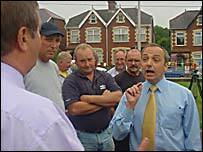 Recently six councillors in Maesteg were deselected for opposing proposals by the local party bigwigs to merge Bridgend with the Vale of Glamorgan - a merger which in reality was never going to happen, not least because Leighton Andrews (Lab, lest we forget) was also opposed to the idea, and he was the minister responsible for local government. Are we to believe that the ward branches simultaneously rose up as one and gave their representatives the boot? And the mind boggles as to how Tyisha ward could have come to the conclusion that Keri Thomas was the right man to represent that ward for another 5 years. For the first time, wards are democratically electing Councillors elect, I hope Bill gets another chance. People not happy with Plaid in Llangennech, over many issues.you are welcome to come and talk to the school protesters and make up your own mind. Not sure what happened in Maesteg but I can categorically assure you that it was totally in the remit & power of the Lliedi ward to select their candidate with absolutely no interference from 'big wigs' as you call it. This is the same for all the wards in our constituency . He was not de-selected as such as he is a candidate if he chooses to run in another seat which I hope happens as he is a real fighter for the whole of Llanelli and would be sorely missed. As far as Keri is concerned I understand that he isn't standing again due to his ill health. nothing new here, just a nationalist trying to make anyone that is unwilling to conform to enforced welsh language education anti welsh language, I am not anti welsh language far from it, but when it is being forced on families who do not wish this for their children then yes I am going to campaign against it, am not a full on labour member i joined to vote for jeremy corbyn, which i was not able to do as i joined too late, i am totally disenfranchised by all political parties at the moment, welsh labour and plaid cymru are an absolute disgrace as far as i am concerned. Just for the record if our local school was to be made an english stream only school, i would still be fighting for it to remain dual stream. so how about instead of slating people you do not know, find out what is really happening first!!!!! Michaela, can I suggest that before you continue with your campaign that you make a New Year's resolution and go to one of the Welsh for Adults classes in your area to find out what it is you want to deprive your own children and those of other families of? That would be a much more constructive thing to do. You might actually enjoy it and understand what this is all about if you did. I have no intention of going to Welsh for Adults classes thank you, and I am pretty sure that I am not depriving my child of anything by putting him through school through the medium of English, I am not trying to deprive any children of anything, I am fighting for the right of a choice, Welsh education is fantastic and should be encouraged but, it is not right for every child, no one in their right mind can possibly say it is best for every single child to learn through the medium of Welsh. My son had done over a year in a class where no english has been taught and was immersed in the Welsh language and he was a very unhappy little boy, had nightmares and was constantly upset going to school, he is now in the English stream and is thriving and runs to school excited every day, now why would I put him through an education in which he does not understand the language, I agree that Welsh education is great for some children but cannot ever agree that it is right for every child. Just because I am campaigning to keep TWO languages at our school does NOT make me ANTI WELSH LANGUAGE. I respect everyone's right to speak welsh and be educated through the Welsh language but unfortunately it is only the people who are fighting to keep the two languages as a choice that are being reasonable. As soon as anyone fights against this we are made out to be monsters who hate Wales and the Welsh language, well sorry to disappoint you all, I am very proud to be Welsh, I love Wales and I think the language should be saved, but you are all going about it in totally the wrong way. Unfortunately, Michaela, you do yourself no favours by your introductory phrase "nothing new here, just a nationalist trying to make anyone that is unwilling to conform to enforced welsh language education anti welsh language...."
If it wasn't for "just nationalists" - words you spit out with some venom IMO - then the Wales you proclaim to love would be massively poorer. If "nationalists" like Y Cyneifiwr hadn't fought battles and campaigned over many years to preserve the ever-dwindling culture and heritage of Wales then a lot more of what makes this country precious would have gone forever. I for one am grateful for their efforts to hold on to what we've got, and I believe there is an increasing understanding and sympathy among more enlightened people throughout Wales as to their aims. If I could understand a word you were saying jeff3 I would happily change from 'anonymous' to jeff4 so that everyone would know my identity. I gather from Bill Thomas that he was offered the chance of standing against me in my Ward, Hengoed, and against Cllr John Jenkins in Elli ward, but turned both down. Privately the Labour Party Councillors are quite concerned by the lack of signs that their increased party membership will convert into increased share of the vote. Frankly, Bill Thomas has has too much integrity to fit into the local Labour Party whatever colour it is. They find him am embarrassment, I find him an inspiration. He tells me that he is not, despite what has happened considering standing against the Labour Party. The wheel of justice turns very slow but does it turn full circle in a lot of cases? It seems the people who are honest and have integrity suffer the most. As an interested observer from outside Carmarthenshire is there a particular reason why the Labour Party should deem Bill Thomas as unsuitable to stand in the ward he has represented for so long? And yet, seemingly, offer him two alternatives as a consolation prize. Intriguing. Bill Thomas was deemed suitable as a candidate. No matter how this is spun the facts of the matter is that the decision was entirely down to the members of the #Lliedi ward and no-one else. He stood against Rob James at the #Lleidi Selection meeting and was not selected for whatever reason. Those voting have to be members for at least six months. It is not up to the Llanelli CLP to question the decision of #Lliedi BLP providing the selction procedure complied with the rules of the Labour party and there is no suggestion that it wasn't. He was not deselected from standing as a candidate. To say that the Llanelli CLP find him an embarrassment is as far from the truth as you can get and quite disingenuous. There were no 'offers' he is entitled to apply for any seat that is open for selection as are the other candidates. Thank you for the explanation. History now but I wonder if the selection vote would have gone the same way if the full facts about Rob James' shocking attendance record at NPT were known. He would undoubtedly have pitched strongly on the fact he'd been a councillor in NPT and no doubt done a great job here. The fact is if he stood here next year he'd almost certainly be shown the door. Fool me once, shame on you. Fool me twice shame on me. I can't speak for Neath CLP but I'd guess they certainly consider him an embarrassment right now. So its up to the ward to decide who is selected to stand ? I find that very strange . Bill Thomas cannot be "told" by clp or anyone what he "has" to do . Suzy Curry is finally "allowed" to stand . Hmm interesting when she works full time or is that part time or voluntary in clp office ? Then fozia in llwynhendy . Well how many labour members are in lkwynhendy . I assume quite a few of her family . Theres 3 children 18+ her 2 nieces nephew mum and dad and sister shahana who us standing in lleidi with james . Yet Chris Beer was in with no chance once fozia and davies got back as buddies . How did fozia leave labour then run back to them AND it was kept out of the press ? Very fair selection process id say !! Chris Beer would almost certainly have been elected he lives in the area with his family and is well known . But he cant complain to cardiff about not being selected as it was a democratic process ! I think your information is wrong here sir . Fozia is NOT a business woman . She is a disabled carer and has been for years and is ill herself apparently . Her family did however own the john street post office which was sold at auction after auditors went in and threw the family out without their handbags and phones . A couple of months previously the daughter turned up with 13k to put back what she borrowed hence the second visit . Funny how it was not mentioned in public though . Acting solicitors from randell saunders took it to be heard up swansea then cardiff . Then the daughter smashes a car into a L plate driver and flips him on his roof with no insurance . Silly ban is made . Thats okay daughter has a new car and drives around with just one letter in her name differencing her from younger sister . Oh the joys . Apparently Bill was told ( by the CLP) that he was "too old" and that his "semi- blindness" (he has sight in one eye only) was a problem. An outrageous case of discrimination, to be settled in court? I am a member of the Labour Party in Llanelli and I am aware that there is bullying going on and those commenting on here denying it are bare faced liars. However, I'm told there's bullying in the other party too so Labour are not alone here. Bill Thomas will be sorely missed. A by-election should have taken place in Tyisha, The ward has been looked after by the Glanymor councillor. She has 2 wards with huge problems to take care of. Very unfair but I understand from residents I've spoken to that she has helped many in both wards and continues to work hard for them. I've lost all faith in Nia Griffith. I don't like what's happenning to my party. @Anonymous @0.97 or should I say Jo? What bullying is going on and by whom? Calling people in your own party 'bare faced liars' is pretty vitriolic although I totally agree that a bi election should have been held long ago as Keri has been unable to perform his duties for a very long time. That is up to the Labour Councillors Group not the CLP. You would have to look at those who are able to make this decision and ask why. Louvain is a great and very active councillor and if she has been 'caretaking' Tyisha then I hope those who put her in that position are very grateful to her. As far as Suzy Curry 'finally' being allowed I am not sure where that has come from. Nobody is more qualified to stand than her having been campaigns manager and fund raising officer for years and always being available to help whoever needs it as well as being in full time employment. Chris Beer would also make a fine councillor so I hope gets a seat. As far as Nia is concerned I am not sure what on earth she has to do with this although we do have a lot of members, lately, who love to shout very loudly criticising from the sidelines but who in reality do not raise even their little pinky finger to help their party in anyway. Nia stopped Suzy standing in 2012 in Hengoed . Louvain works with dafen . You assume its jo 9.47 anon . It could be several members due to the bullying friction and attitude of clp cllrs doing everything "their way" lately .Are Party rules really being adhered to ? I love the comments on this thread. It reminds me why Labour are as much a party for Wales as the Tooting Popular Front. As for Gary Jones's dramatic reinterpretation of history, I am trying not to laugh at the comedy value of seeing a candidate reject everything his local party connived at in power as well as not supporting and willfully misunderstanding his own party's education policies. Has he actually read them? When he has taken a break from re-fighting the Spanish Civil War, perhaps he should. As one of the 'deselected' Councillors in Bridgend, just to confirm - all six of us were purged at Local Campaign Forum level in an interview with local party grandees. It didn't even get the chance of getting so far as branch level where my members no longer have the opportunity of telling me they want me to stay or want me out. The interview consisted of 60 minutes of questions - 30 minutes of which was an inquisition on the whip. Keri Thomas was also dragged from his hospital bed by the so called cousin and sharen davies yo make sure he had his 6 month meeting in so labour would not have a by election then returned to his hospital bed by the same jeff and sharen a hour later !! City Deal; Neath Port Talbot threaten to pull out...and Cadno on the Carmarthenshire 'debate'. Saint Mark or Mr Burns?